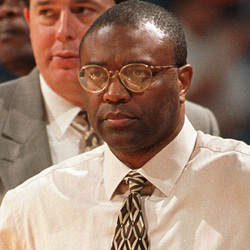 Leonard Hamilton was hired in April 1990 as the second head coach after the Hurricanes reinstated men's basketball. Coach Hamilton manned the helm for ten years, guiding the program back to national prominence. His teams had the ability to surprise major programs and pulled off big wins over traditional basketball powerhouses year after year. Hamilton's career began only months before UM joined the BIG EAST, then without question the preeminent basketball conference. This level of competition made every game a playoff game for the 'Canes, as they learned to face the best teams early on. The tough training ground made the Hurricanes basketball squad fear no one, and the results were terrific: under Hamilton's tutelage the 'Canes notched important victories season after season and built on positives each year. In just a few years Hamilton had his scrappy young 'Canes getting in to the NCAA's March Madness excitement, earning three straight bids from 1988 thru 1990. In 2000, his last year leading the 'Canes, UM made it through to the Sweet-16 for the first time in school history; a year in which they won a record 23 games, and finished the season with a Top-25 national ranking for the first time in nearly four decades. In 2000 Hamilton left the Miami program in excellent standing when he took the opportunity of a lifetime to coach Michael Jordan and the NBA's Washington Wizards. Hamilton's tenure provided Miami, both the city and the University campus, with its first taste of big-time college basketball excitement since the program's heyday in the 1960s. He is currently the head coach at Florida State University.